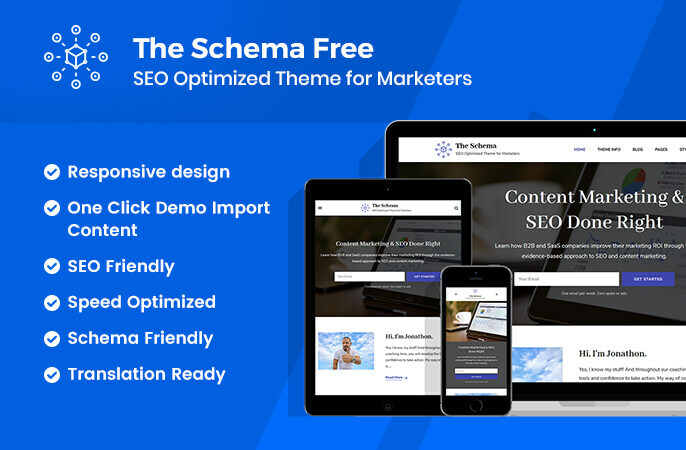 The Schema is a clean and fast, free WordPress theme that helps Google understand your content more effectively so that your blog’s contents get easily ranked on the SERP. The theme with its rich snippets support helps search engines identify the structure of your website’s content which means you will rock at content marketing. The Schema helps you build an authority website with less effort. Like all our other themes, The Schema has intuitive theme panel and is fully responsive. You want to become a professional blogger but don’t know how to code. You are starting a content marketing business and are looking for a web template that supports rich snippets. You want to become an authority and an influencer on your niche in less amount of time. You want a theme that keeps your user engaged with UI/UX optimized design. You want a clean, responsive, and speed optimized WordPress theme for free. You want friendly and fast support if you run into problems. You want to kickstart your project with free demo content import. You are a web development company and your client wants a Schema.org ready blogging website. Rich Snippets help search engines like Google accurately identify the different content of your webpage which means if your website has rich snippets you have a better chance of ranking on Google. The Schema is Schema.org ready and supports rich snippets so that Google can understand your blog better and prefers to rank you. Therefore, we have made The Schema super fast. We have also added some performance settings that you can enable to speed up your website. Smartphones are quite popular. Most of us use the Internet on a mobile phone, and according to stats, more than 50% of the Google searches are made on mobile devices. So, it is vital that your blog has a responsive design. The Schema has a perfect mobile-friendly design. The theme also passes Google mobile-friendly test. This means your blog adjusts itself to every screen size and you get boosts in search results while providing a smooth experience to the visitors. Don’t have time to setup your blog from scratch? You can import all the images, text, and settings from the live demo of The Schema free theme with a click for free. Get started with writing and creating your empire without wasting hours on making the theme look awesome. Search engines will fall in love with your rich-snippets enabled website. We have worked with our SEO experts to make The Schema ultra SEO optimized with fast page speed, rich snippets support, mobile-friendliness, and other code-level settings. You can start building your audience base easily with The Schema. You can add Newsletter form on the Banner section so that your fans can easily opt-in to your email newsletters. If you to become an influencer of your niche, you should brand yourself with your blog. The Schema has a home page section that allows you to introduce yourself to your visitors so that you can build trust. The Schema allows you to display the last updated date of the post on a single post as well as listing page. Showing the updated date of a post helps you rank better in the search engine as well as help your audience know that you update your post frequently, which increases the trust on your website. Like to display sidebar on the left or right? Or hate sidebars? The Schema allows you to choose from 4 different post/page sidebar layouts. Well, the theme also supports the centered Medium-style post/page sidebar layout. If you have been searching for a Medium-like layout, The Schema got your back. The Schema helps you show the related post at the end of the single post page. The theme displays the related post based on the category of the post. This feature helps you boost user engagement. You can show the summary of the posts by enabling post excerpt. You can choose the length of the excerpt up to 100 words. The Schema comes with extensive theme documentation to help you setup your website. Just follow the step by step guidelines on the documentation and your website will be ready in no time. We won’t charge you for using The Schema WordPress theme. And, there’s no catch! You can download and use the theme for free for the lifetime and on any number of websites you want to. There are no hidden cost or any limitations on using the features included in this theme. The Schema allows you to display your social media links on your website so that your visitors can find you on social media. Social media on your website will also help you boost your business’ engagement. The theme also supports Russian and Chinese social media like OK, VK, Xing, and others. You can add unlimited social media on your website. The Schema theme is fully compatible with WooCommerce plugin. You can create your own products and start selling on your blog with The Schema free WordPress theme. The Schema has ample space for widgets. You can add and manage the widgets you require without compromising the design of the theme. Widget ready design and code allow you to customize your website as you desire easily. The Schema is clean and has an eye-catching, modern design that will mesmerize your visitors. The theme will create a good, long-lasting impression on your users. Confused? Got Questions or Ideas? We are here to help you. You can contact our friendly support team through our support ticket if you need any assistance regarding the theme. The Schema is cross-browser compatible, which means the theme will work seamlessly with the popular web browsers. The theme is tested on Chrome, Firefox, Internet Explorer, Edge, and Safari. With the perfect font type, size, spaces, and contrast, The Schema makes sure that your content is easy on the eye and your visitors enjoy reading what you have to say. Don’t let the language barrier come between you and your website. The Schema theme supports localization so that you can use the theme in your local language. Do you use right-to-left (RTL) scripts like Arabic? Well, worry not! The Schema supports both LTR and RTL languages. You can write content with confidence! You will receive updates on a regular basis. We frequently update our themes for the latest security and technical standards. So, your website will be safe from vulnerabilities. You can easily add your own logo on your website using The Schema theme. Want to modify some CSS effects or change the color of a section? The Schema allows you to add CSS effects right from the customizer easily. Customization and editing the theme is straightforward as the theme was built on clean, well organized, and commented code.